Learn about the rules for using drones in South Africa in this post! South Africa has pervasive regulations regarding drones. However, I have received information from the aviation authority that these rules apply only to local users. Nevertheless, I would stick to the given limits (altitude, distances, etc.). Maximum Altitude: In South Africa, the maximum permitted altitude is 45 meters above ground. However, private drones can not ascend higher than the highest obstacle within 300 meters. Maximum horizontal distance and FPV: For private drone flights, your copter must not be farther than 500 meters away from you. Compulsory insurance: In the country, valid drone insurance is mandatory in South Africa. Maximum take-off weight (MTOW): From a take-off weight of 7 kilograms, approval from the South African Civil Aviation Authority (SACAA) is required. Distance to airports: At airports, a distance of 10 kilometers must be observed. Other safety distances: In South Africa, you can approach a maximum of 50 meters of crowds and public roads. The same applies to private property as long as you have not received any consent from the owner. No Fly Zones: Drones are prohibited in many national parks. So we have already heard that cars in Kruger National Park are checked in front of the driveway and Copter may be confiscated. Operating Hours: Drone flights are only allowed in daylight. Requirements for commercial pilots: Commercial flights have to meet extremely high requirements. Take a look at the link below. In the right side column many more information is linked. Good to know: Anyone who does not comply with the applicable laws must expect imprisonment of up to ten years and/or a fine of up to 50,000 rands (about 3,550 euros). 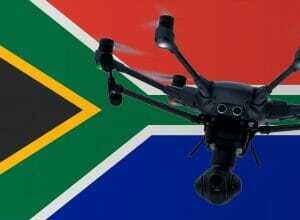 We have researched the listed drone regulations for South Africa to the best of our knowledge. We cannot guarantee the correctness of the information. If you want to be on the safe side, contact the competent aviation authority. Alternatively, you can also ask the embassy in your country for further information about the regulations. Please leave us a comment when you receive news and/or gain experience with your copter in South Africa! Hello! I was wondering what you had to do at customs on arrival to South Africa. Do you need to declare your drone? Any paperwork? Was it difficult? Thank you! Do you had to do something at customs when you arrived? Anything they asked for? Did anyone get an answer to the above questions? Also, where do you purchase drone insurance from? As far as I know, you don’t need to declare your private drone with customs when you arrive. Thanks for the drone rules information in the various countries. Before I came across it, I have only ever had the drone rules for South Africa. I’ll refer people to your site for this information around the various countries.